Hypochilus petrunkevitchi - photo by Marshal Hedin from Wikipedia. The current Taxon of the Week arguably has a pretty poor claim on the title, because it is no longer recognised as a valid taxonomic grouping. As I have explained before, modern spiders can be divided into three suborders or infraorders or what-have-you. The Mesothelae or Liphistiomorphae (segmented spiders) are a small group distinguishable from all other spiders by their obviously segmented abdomens. The Mygalomorphae (vertical-fanged spiders) have fangs that move straight up and down, and include the trapdoor and funnel-web spiders and American tarantulas. The largest group of spiders by far is the Araneomorphae (cross-fanged spiders), with fangs angled towards each other, including orb-weavers, cobweb spiders, jumping spiders, wolf spiders, and pretty much any other spider family you're likely to be familiar with. However, some older references may list a fourth group, the Hypochilomorphae, and it's with the latter that we're dealing today. 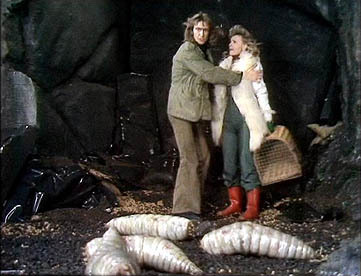 The Tasmanian cave-dwelling austrochilid Hickmania troglodytes. The four yellow spots visible on the underside correspond to the positions of the book lungs. Photo by Niall Doran from here. The 'hypochilomorphs' include three small families, the Hypochilidae, Austrochilidae and Gradungulidae, that are now regarded as basal members of the Araneomorphae. Like other araneomorphs, they possess fangs that are angled towards each other rather than parallel. Where they differ from other araneomorphs is in the number of book lungs they possess. Book lungs are the ancestral respiratory structure for all arachnids, and evolved from the gills of their aquatic ancestors as they adapted to life on land. They are little more than gills recessed into the underside of the animal and covered over to prevent moisture loss, and the name "book lung" refers to their appearance in cross-section like leaves of a book. The ancestral number of book lungs in arachnids is four, though many arachnids (particularly the smaller forms, and including some spiders) have independently replaced the book lungs with tracheae, or lack any specialised respiratory structures entirely. Most araneomorphs with book lungs have lost the posterior pair and only have two book lungs. Hypochilomorphs retain the posterior pair, demonstrating their basal position to other araneomorphs and causing them to all too often be damned with the execrable title of "living fossil". However, because this is an ancestral feature rather than a derived one, it does not indicate that hypochilomorphs form a group exclusive of other araneomorphs, and other features make it clear that Austrochiloidea (Grandungulidae and Austrochilidae) are more closely related to the other araneomorphs than they are to Hypochilidae (Griswold et al., 1999). The remaining araneomorphs have usually been presented as a single clade (the Araneoclada), though at least one species of Filistatidae, Kukulcania hibernalis, possesses posterior book lungs as a juvenile, suggesting that family lost the posterior book lungs independently of other araneomorphs, and Lopardo et al. (2004) suggested that Filistatidae may be outside the Austrochiloidea + Araneoclada clade. 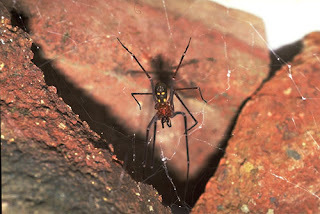 The Hypochilidae are large spiders found in Asia and North America. They construct a unique web for snaring prey, often referred to as a "lampshade web" in reference to its shape, though if the description in Forster & Forster (1999) holds for all hypochilids, then the photo on the Wikipedia page for this family is quite possibly upside down. According to Forster & Forster, Hypochilus builds its web on the underside of an overhanging rock, with a tightly woven upper section flaring out around the lower circular edge. Hypochilids are mostly montane species. The Austrochiloidea are restricted to Southern Hemisphere continents - the Austrochilidae are found in southern South America and Tasmania, while the Gradungulidae are found in eastern Australia and the South Island of New Zealand (Forster & Forster, 1999). 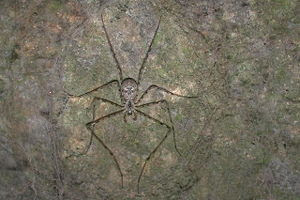 The Austrochilidae build large horizontal webs, but many Grandungulidae have abandoned web-building and become active hunters. The Gradungulidae are characterised by the significant increase in size of one of the claws on the legs, which is used to great effect in seizing prey. 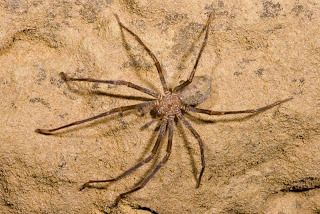 In one of the Australian web-building species, the cave-dwelling Progradungula carraiensis, a long, sparse web is built between the ground and an overhang, up to and exceeding a metre in height. The spider itself sits head downwards at the base of the web, low enough that the front legs are near the ground. Any suitable prey that walks by the spider is grabbed with the front legs and bitten. The prey may be eaten where it is caught, or carried up to the top part of the web that also serves as a retreat for the spider. One of the New Zealand species, Pianoa isolata, has abandoned the web but hangs down among strands of dense moss, catching its prey in a similar manner to Progradungula. A New Zealand cave-dwelling species, Spelungula cavernicola, shown above in a photo by Paddy Ryan, is an active hunter but often feeds on its prey suspended in mid-air from a silk dragline. The round egg-sacs are also hung from draglines, probably as protection from potential predators. Forster, R. R., & L. M. Forster. 1999. Spiders of New Zealand and their Worldwide Kin. University of Otago Press: Dunedin (New Zealand), and Otago Museum: Dunedin. Griswold, C. E., J. A. Coddington, N. I. Platnick & R. R. Forster. 1999. Towards a phylogeny of entelegyne spiders (Araneae, Araneomorphae, Entelegynae). Journal of Arachnology 27: 53-63. Lopardo, L., M. J. Ramírez, C. Grismado & L. A. Compagnucci. 2004. 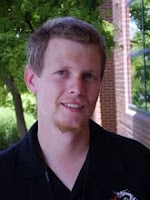 Web building behavior and the phylogeny of austrochiline spiders. Journal of Arachnology 32: 42-54.